I must tell you that it was very hard for me to keep this secret. When I have good news, its hard for me to keep quiet about it. Even now I find myself editing this post so that you don't figure out if it is you or not! I have been thinking over and over about what kind of piece to do for you. 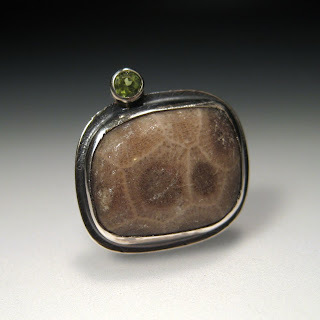 I did some research and had Hans cut me a custom cabochon to use in this piece. I wanted something to remind you of the earth's natural beauty, but to keep the lines simple and modern. Secret Santa--Most of all I want you to know that I wish you all the beauty, love and joy of this holiday season. How exciting! I can't wait to see who gets your lovely gift. I mailed mine in a rush and didn't take a picture. Hopefully my recipient will take one for me. I wish that I could see yours Ashley!!! That is really nice. I like the green accent. Your secrect santa is going to be so excited to receive this!